It looks like the number of Norwegians in favour of joining the European Union has reached a new low, and this certainly has to do with Germany recently not being happy with its unofficial role as Europe's banker, and Norway with the second-highest GDP per capita in the world certainly doesn't look forward to a similar role (join the union and you can help bail out the next Greece!) if it were to join. 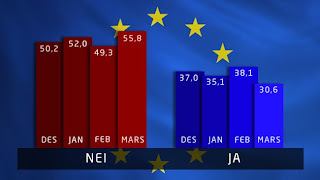 So those saying yes to the idea of EU membership have gone from 37% in December to 30.6% now, and no has gone from 50.2% in December to 55.8% now. Assuming the current situation with Greece has something to do with it though there should be a swing back to 'normal' levels in the next month or two, though it could still remain lower than the previous average. On a related note, when Iceland's economy tanked one of the options given besides either joining or staying out of the EU was a possible union with Norway. Just becoming a single state (fylke) would certainly be impossible for a proud independent country, but a more equal union but including using the Norwegian krone might have been a viable option if Norway had pursued it with a bit more zeal when Iceland's economy was at its worst.